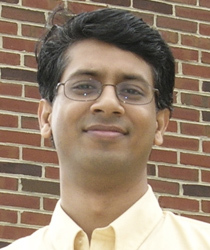 Dr. Rajeev Barua is an Associate Professor of Electrical and Computer Engineering at the University of Maryland. He holds a joint appointment the Institute for Systems Research, and an affiliate appointment in the Computer Science department, both in the University of Maryland. He received his Ph.D in Computer Science and Electrical Engineering from the Massachusetts Institute of Technology in 2000. SecondWrite LLC has received TEDCO funding from the state of Maryland for an amount of $100,000. Danny receives ARCS Scholarship for third consecutive year. Anand, Fan, Guan, and Xie recognized for outstanding research. Aparna Kotha was selected to lead the ECE Graduate Student Association for the 2010-11 academic year. Research showcases UMD technology advancements in electrical and computer engineering. Professor's rewriter will allow any binary code to be rewritten and improved. UMD will collaborate with Princeton, BAE Systems to compile serial programs into parallel programs.